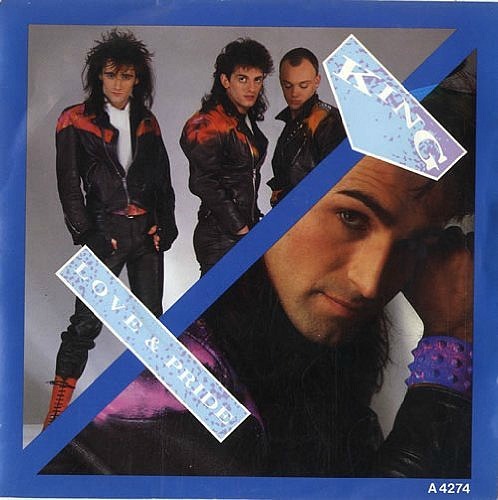 King were an 80's new wave pop/rock band from Coventry (England), and "Love and Pride" was their biggest hit single, reaching #2 in the UK singles charts in February 3rd 1985 for three weeks, after being re-released - the original release of the single in 1984 only reached no.84 in the UK. The single re-entered the chart at No. 82 on 30th Dec 1984 and spent a total of 18 weeks in the chart. It was cruelly denied the top spot by Elaine Paige and Barbara Dickson's "I Know Him So Well". As a band, King released two studio albums, Steps in Time which reached #6 and Bitter Sweet which peaked at #16. They and also achieved success with a total of five Top 40 singles between 1984 and 1986. The video is set in a rubbish dump with an old car and pieces of scrap metal covered in multi-coloured spray paint. Paul King is wearing a green suit and is spray painted boots. Eventually we see the band performing amongst the graffiti-covered rocks. A group of boys run towards them and spray their boots with paint and perform a dance routine, with some of them break dancing. In 1987, Paul King started a solo project and released the album Joy which was produced by Dan Hartman. However, neither the album or single releases managed to break the UK Top 40. In fact, the album failed to even chart. Alone without You was released in August 1985 and went on to reach #8 in the British Isles. This was the first track to be lifted from King's second album Bitter Sweet. The B-side included an unusually-titled track called I Kissed The Spiky Fridge (Rock Hard Mix), with the 12" version also featuring the USA Summer Mix of Love & Pride and the Scorcher Mix of the A-side.